During my walk along Hadrian’s Wall, I discovered the tree that was used in the filming of Robin Hood: Prince of Thieves with Kevin Costner and Morgan Freeman. I am not sure though why Robin Hood is at the Hadrian’s Wall in Northern England on his way back from Jerusalem via Dover to Nottingham. That sounds like quite a detour to me. 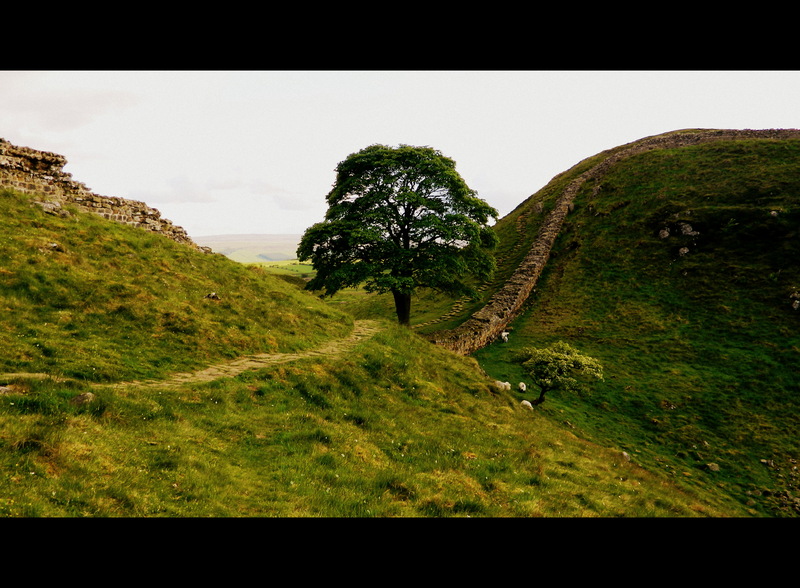 This entry was posted in Films, Photography, Travel, UK and tagged Hadrian's Wall path, movies. Bookmark the permalink. Well, since this is the only flaw of a movie without errors, I would think, this has some meaning. :D Maybe, everyone, coming home from battle, has to pay tributes to this tree .. or climb hadrian’s wall? Oh come on, you couldn’t find a better version of this old tale than the Costner one? Fer cryin’ out loud, I’d take a shot from “Robin Hood: Men In Tights” ANY day over Kevin’s hilariously poor attempts at a British accent! What a great photo. I always wondered why they chose that tree though as it is a 300 mile round trip from Sherwood Forest. There must be other walls in Southern England with beautiful trees overhanging them.